America’s Special Days salutes Flag Day (June 14th) with our guide, Francesca. The program examines various symbols, with the main focus being America’s flag, the symbol of our country. Much of the program focuses on people and how they view the flag. The program begins and concludes with a Flag Day parade in Appleton, Wisconsin, the birthplace of Flag Day. Also included in the program are: a poem entitled “The Flag We Fly,” by Aileen Fisher, the history of Flag Day, a unique trip to a flag factory, flag etiquette, the Pledge of Allegiance, and the meaning of the red, white and blue. An exciting conclusion is the National Anthem with words on the screen, so that the viewers can sing along. 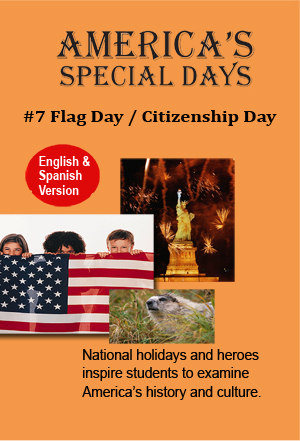 This program can also be easily adapted and used for Citizenship Day.